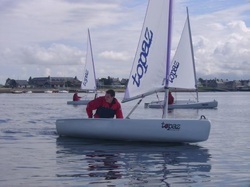 The aim of this two day course is to offer an enjoyable introduction to dinghy sailing where safety, fun and expert tuition are the key elements. How to sail in all directions, including an awareness of launching and recovering. Minimum age 16 years of age. Be able to swim 50 metres. If unable to meet this swimming requirement due to disability please phone the centre to discuss any special needs.